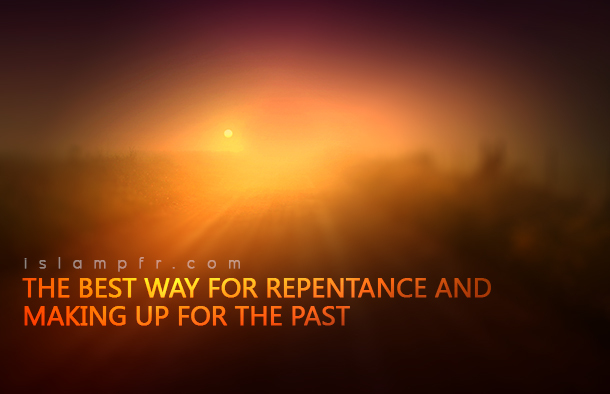 What is the best way for repentance and making up for the past? It seems that perhaps the best way to compensate for a sin (after repenting) is for the sinner to make effort with all those organs involved in the sin to obey God, as feeling repentant and regretful is not enough. One: Becoming repentant and contrite of what one has done in the past. Two: Taking a serious decision, not to commit that sin again. Three: Compensating for any wrong doing towards any person so as to meet God while you do not owe anything to them. Four: Fulfilling any obligation required by the divine; doing whatever one was supposed to do but has not done so. Five: Trying to melt the flesh that has grown on one’s body from the forbidden (Haraam) with asceticism and worship, such as fasting and mid-night prayers, until it is replaced by new flesh. Perhaps the sixth step implies that it is necessary for every part of one’s body which has experienced sinful pleasure to be punished with worship and austerities. It should be noted that this saying of Imam Sadiq (PBUH) does not contradict the words of Imam Ali (PBUH), as austerity without spiritual purification was not what Imam Ali (PBUH) prescribed since it will not have the intended spiritual effect. The same goes for Imam Sadiq’s (PBUH) words. This means that one must first become devoted to God whole heartedly and achieve deep spiritual transformation. If he succeeds, physical austerities and worships will come automatically.